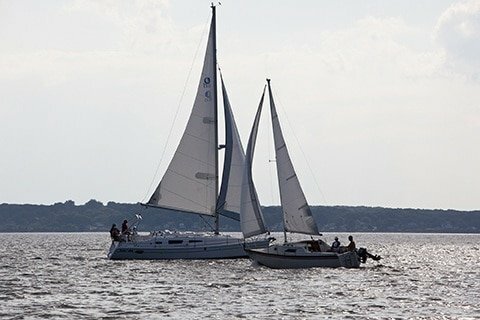 We offer Sailing Lessons and Coastal Cruising coaching at our Rhode Island based sailing school. 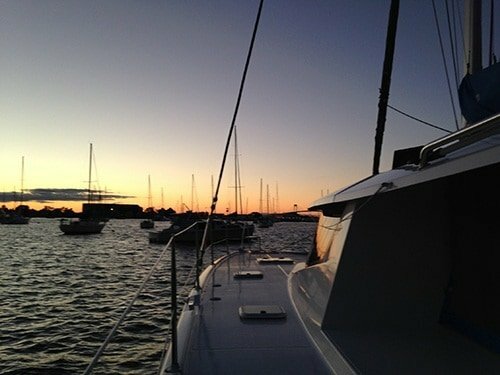 Starting as a sailboat dealer years ago, we have seen customers struggle with the dilemma of having the desire to get into sailing, but could not justify spending the money to buy a boat without knowing if it was something the family would enjoy, not to mention not having the knowledge base to make an intelligent decision. We have spent a lot of energy in coming up with a formula where folks could “test the water” without having to break the bank. At Narragansett Sailing we offer a multitude of different paths to sample sailing and see if the family thrives with it or not; without making a big financial commitment. So you have the itch to either learn to sail or further your skills! There are tons of good schools around, each with different philosophies and different slants on how to impart the appropriate knowledge and confidence. There are two main accreditation organizations, US Sailing and the American Sailing Association. These organizations do not dictate to a school HOW to teach, they both provide standards of what needs to be covered. The HOW depends on the school itself, and there are a lot of different methods out there. Here at Narragansett Sailing School we are an ASA certified facility and teach Coastal Cruising from the get-go. To get you comfortable with a cruising boat faster, we start you out on a 30’ boat with wheel steering and inboard diesel engine which is more intuitive than a smaller boat steered with a tiller. We have created an integrated SYSTEM that not only will teach you how to sail; but will give a variety of boat options to hone those skills. After instruction you can rent a boat for a day or a week, chartering increasingly larger boats as your confidence and skills grow. You can also join our Flotilla’s renting a cabin for a week with a captain. How is our teaching different? We are first and foremost a CRUISING oriented school, where you will learn to sail without focusing on ‘sail trim’. We use a sailing method using fixed boom position while being aware of wind direction and not get bogged down with adjusting the sail constantly for maximum efficiency. So the beginning student can focus on all the other things to learn and we get to sail trim and sailing efficiency in the later courses. Think of it as learning to sail with training wheels. We suggest you only need to know five things to make a sailboat go. We can teach you those five things in an hour, and by the afternoon you are sailing the boat around the harbor knowing what you are doing. This doesn’t mean you know how to make it stop, or what the buoys mean, or which way you need to pass another boat… Those are the things we teach on day two and three of ASA 101. Some schools say they can teach you the sailing standards in two days. I think you can be exposed to it; but not learn it in two days. We are a hands-on school. Our average day is two classroom hours and five hours sailing. There is no substitute to doing a maneuver again, and again, and again. That is an important part of turning those new skills into intuitive movements. Additional sailing time is available after the class is done, if you want to cement those skills. Very few schools have an instructor on staff that gets ‘Instructor of the Year’ as it is a difficult thing to get. It is based on customer service scores returned to ASA by graduates. Out of the 4,000 certified ASA instructors, only the top 20 get this award, or about 1/2 of 1%. Go to ‘OUR FLEET’ to see why we use vintage boats for our beginning sailing. Go to ‘OUR INSTRUCTORS‘ and see why our instructors are different from most schools. Go to ‘WOMEN’S PROGRAM’ to learn about our women teaching women program.